"Instead of investing in their own computer research and development, engineers at the NASA Ames Research Center are looking to cellphones and off-the-shelf toys to power the future of low-cost satellite technology. The smartphone in your pocket has about 120 times more computing power than the average satellite, which has the equivalent of a 1984-era computer inside. "You can go to Walmart and buy toys that work better than satellites did 20 years ago," said NASA physicist Chris Boshuizen. "And your cellphone is really a $500 robot in your pocket that can't get around. A lot of the real innovation now happens in entertainment and cellphone technology, and NASA should be going forward with their stuff." "The hexadecagon-shaped personal satellite, called TubeSat, weighs about 1.65 pounds and is a little larger than a rectangular Kleenex box. TubeSats will be placed in self-decaying orbits 192 miles above the earth's surface. Once deployed, they can put out enough power to be picked up on the ground by a hand-held amateur radio receiver. After operating for a few months, TubeSat will re-enter the atmosphere and burn up. "It is a pico satellite that can be a very low-cost space-based platform for experimentation or equipment testing," says Randa Milliron, CEO and founder of Interorbital Systems. About 20 kits have been sold and 14 more are in the process of being handed over to customers, says Milliron." Video from a Google NexusOne smartphone with specially programmed Android apps, installed aboard James Dougherty's Intimidator-5 on a CTI N4100 load. Launch from Black Rock Playa on 24-July-2010 thanks to Maverick Civilian Space Foundation. NASA is inviting the public to choose an area in northern Arizona where explorers will conduct part of the annual Desert Research and Technology Studies, known as Desert RATS. "Desert RATS is an annual test where NASA takes equipment and crews into the field to simulate future planetary exploration missions," said Joe Kosmo, Desert RATS manager at NASA's Johnson Space Center in Houston. "We want the public to be a part of this." The website features interactive panoramic images of lava, rocks and desert for the public to choose as the most interesting destination to explore. The location that receives the most votes will be announced Aug. 16. Astronauts will visit that site to perform field geology and collect rock samples. "Officials with The Conrad Foundation today announced ManSat Limited, a global commercial space corporation headquartered on the Isle of Man , has joined with the Conrad Foundation to expand the 2010-2011 Spirit of Innovation Awards program on the international stage. ManSat will sponsor a national competition on the Isle of Man from which one finalist team will participate in the annual awards competition, which gives high school students the opportunity to design, develop and commercialize innovative products that help solve challenges of the 21st century." The UK Space Agency has announced a one year pilot programme to design and launch a CubeSat - a miniature, cube-shaped satellite that will allow the UK to test new space technologies and carry out new space research 'cheaply' and quickly. The pilot programme, named UKube-1, will use the Clyde Space CubeSat platform and will involve a competition amongst companies and academic groups to come up with the most innovative ideas for payloads. 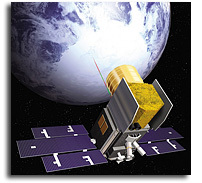 UKube-1 will be launched on the satellite in mid 2011. Speaking at the Farnborough International Airshow, the Minister for Universities and Science David Willetts, said, "Britain's first CubeSat will bring major benefits to the UK space industry. Firms will now have a cheap and quick way to test their latest prototypes. Running a competition to see which experiments will go up with UKube1 is an inventive way to ensure it is fitted with the most creative and innovative payload ideas." NASA has announced three new Centennial Challenges with an overall prize purse of $5 million. NASA's Centennial Challenges are prize competitions for technological achievements by independent teams who work without government funding. Keith Cowing using a power washer to get 40 years of dirt off of a Titan 1 ICBM located next to Building 596 at NASA Ames Research Center on 16 July 2010. NASA has selected nine experiments, designed by students at seven schools, for astronauts to perform on the International Space Station this summer. NASA selected the proposals from among 132 received for the new Kids in Micro-g! Program. This is the pilot year for the program, a student experiment design challenge geared toward grades five through eight. Its purpose is to give students a hands-on opportunity to design experiments or simple demonstrations for testing both in the classroom and in the station's microgravity environment. The winners were chosen by a team of representatives from NASA's 10 field centers. NASA announced three new Centennial Challenges Tuesday, with an overall prize purse of $5 million. NASA's Centennial Challenges are prize competitions for technological achievements by independent teams who work without government funding. "NASA sponsors prize competitions because the agency believes student teams, private companies of all sizes and citizen-inventors can provide creative solutions to problems of interest to NASA and the nation," said Bobby Braun, the agency's chief technologist. "Prize competitions are a proven way to foster technological competitiveness, new industries and innovation across America."